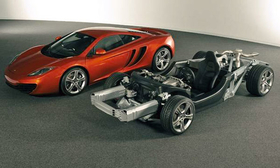 McLaren Automotive will start building the MP4-12C late this year and goes on sale in early 2011. McLaren has announced 35 markets where it will sell the Formula-One-inspired MP4-12C. Ten markets in North America including New York, Chicago, Los Angeles and Toronto, will sell the ultra-light, high-performance sports car starting in the spring of 2011. Other global markets include London, Monaco, Paris, Frankfurt, Kuwait and Johannesburg. McLaren will reveal its first 23 retailers when it shows the MP4-12C at the Goodwood Festival of Speed in the UK in July. Another 12 will be added throughout the year. The North American market will get 300-400 of the 1,000 cars to be made in 2011. It packs an estimated 592 hp.